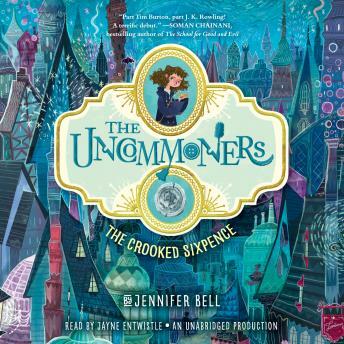 Anyone with a Hogwarts-shaped hole in their lives can’t miss this fantasy series opener. Dive into a secret underground city below London where ordinary objects are capable of extraordinary magic! When their grandmother Sylvie is rushed to the hospital, Ivy Sparrow and her annoying big brother Seb cannot imagine what adventure lies in store. Soon their house is ransacked by unknown intruders, and a very strange policeman turns up on the scene, determined to apprehend them . . . with a toilet brush. Ivy and Seb make their escape only to find themselves in a completely uncommon world, a secret underground city called Lundinor where ordinary objects have amazing powers. There are belts that enable the wearer to fly, yo-yos that turn into weapons, buttons with healing properties, and other enchanted objects capable of very unusual feats. But the forces of evil are closing in fast, and when Ivy and Seb learn that their family is connected to one of the greatest uncommon treasures of all time, they must race to unearth the treasure and get to the bottom of a family secret . . . before it’s too late. Debut novelist Jennifer Bell delivers a world of wonder and whimsy in the start of a richly uncommon series.